Internal communications is critical to your company’s success. And aligning your employees behind your vision, your strategy, and driving daily productivity helps you to get there. Yet, this only works if you can communicate effectively with them. Mobile technology is the most direct means to reaching all of your employees across the organization; and the opportunity exists now to leverage mobile for your IC needs. 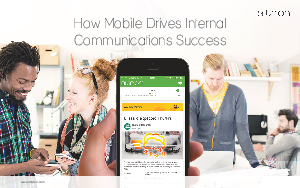 What does mobile communications success look like? Get best practices for establishing a successful mobile strategy and modernizing your internal communications. Download the eBook by completing the form today!